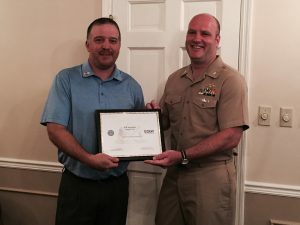 Lancaster, Ohio – Co-Managing Partner Jeff Spangler of Dagger Law received the Patriotic Employer award from the Office of the Secretary of Defense Employer Support of the Guard and Reserve. Associate Bryan Everitt nominated Co-Managing Partner Jeff Spangler for the continued support he shows all the veterans working for Dagger Law. Patriot Awards are awarded to individual supervisors. An employee serving in the National Guard or Reserve nominates the individual for the support they’ve provided. The Patriot Award reflects the efforts made to support citizen warriors through a wide-range of measures including flexible schedules, time off prior to and after deployment, caring for families and granting leaves of absence if needed.